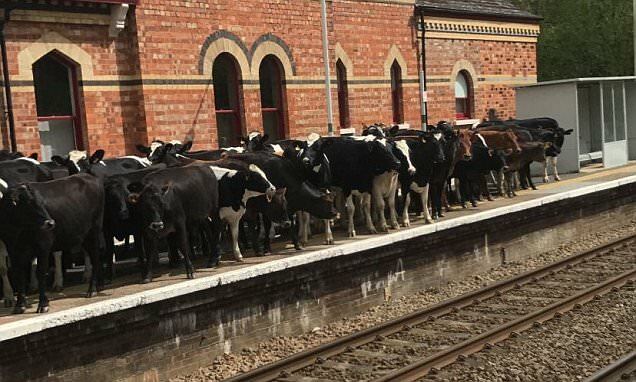 Well, Daisy, I expect we’re waiting for the milk train…..
We all knew that Great Western were cutting costs, but that they’d quite literally resort to cattle-car tactics is simply astounding. Enter a generously sized Greek bloke clad in a kaftan. It was one of his best tracks. So you’re a moosic lover, James? Udderly Janus, but thereby hangs a tail. This brings back some memories, it was the first “eight track” I ever had. And an extremely nice golf course, if I remember correctly Feeg. Especially a horn ensemble like this, eh? I hear there is a uniform dress code for Royal Ascot this year. James, for Hever and Hever and Hever, you’ll be the one…. I think we’ll steer away from that, Janus could just be a load of bullocks. M’learned friend FEEG was nearly correct yesterday. The station is akshully at Heifer, where the milking parlour is rather than the castle, as any fule kno. Next Next post: Reflektioner om Sverige.